The future is bright for those harnessing the sun's energy to transmit power across California. 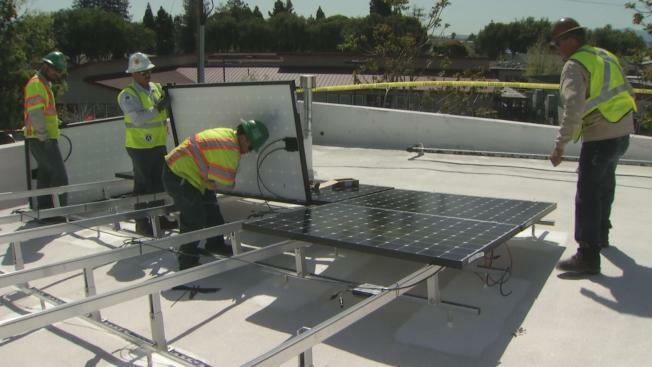 The booming solar industry, which hires more people in the Golden State than anywhere else in the nation and employs more folks than the coal industry, is receiving an extra boost from the San Jose Conservation Corps and Charter School. The school educates the up-and-coming employees of the solar industry and prepares them for their respective futures in the growing industry. "I would say it's the gateway to your foot in the door with a lot of good companies out there," student Jessika Perez said. Solar equipment installation rose by more than 120 percent this past year, and roughly 26,000 people were hired to fill the employment need. "When you install 125 kilowatt job like this is, you need six to 15 people on a job site to install that one job," Randy Zechman, CEO of Clean Solar, said. "We've got multiple crews out every day. It's certainly a growing space." This past year, the amount of solar jobs increased by 67 percent. That number is expected to climb in the coming years. "Right now, we're hiring," Zechman said. "I've got interviews this afternoon and Monday morning."